A hidden gem! Welcome to Birdie Glen Town Home #12, where you are tucked away into a quiet neighborhood on the #1 Birch of the McCall Golf Course, yet just minutes from town. 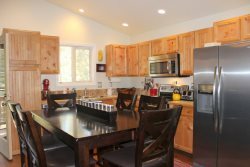 This well appointed 3 bedroom, 2 ½ bath townhome is stocked for all you will need during your McCall vacation and sleeps up to 12 comfortably in beds! Feel right at home as soon as you enter Birdie Glen #12. The main floor opens up to a fully stocked kitchen, dining area, and a comfortable living space that cozies up to a wood burning fire place and flat screen TV. Equipped with basic cable tv and WiFi, all can enjoy the modern comforts of home. The comfortable sectional sofa also converts into a sofa bed that can sleep two. The back deck offers views of the golf course and after a long day of skiing, snowshoeing, hiking, golfing, or sight seeing, you will enjoy a soak in the 4 person Jacuzzi. The upstairs of this town home includes the master suite, 2 bedrooms, a full bath with a shower/tub combo, and a laundry closet with a washer and dryer. The master suite has it's own private balcony overlooking the golf course and a private bath. The second bedroom includes a twin over full bunk bed, and a separate queen size bed, and a twin trundle bed underneath. A perfect room for the kids or family! Across the hall is the third bedroom with a comfortable queen sized bed and windows that overlook the golf course. Birdie Glen #12 includes use of a single car garage and off street parking, and has room for trailers. *Must be at least 25 years old to rent. 4 Wheel Drive is highly recommended in McCall in the winter. We are not responsible for winter conditions, power outages, road closures, ect.